We at Golden Goose PR love to get excited about the Easter Bunny…but this year we are particularly excited about the Easter Penguin. Today, 200 giant decorated eggs are released into the capital – each decorated by incredible designers and personalities, from Vivienne Westwood and Faberge to Bombass & Parr and our very own jewellery client, Robinson Pelham. All have been placed in secret locations as part of the Big Egg Hunt, a brilliant way to raise funds and awareness for Action For Children and Elephant Family. Vanessa Chilton, creative director at Robinson Pelham, had given birth just weeks before when she started work on Robinson Pelham’s egg, designing a giant male Emperor Penguin, nestling his partner’s egg under his belly and away from the frosty ground. The Robinson Pelham egg is decorated with sparkling crystals, each adorning the back of the penguin and reflecting the night’s sky. With 200 remarkable eggs to spot as you travel around London, it’s a fun challenge to see how many you can spot, and to see where you can find them. 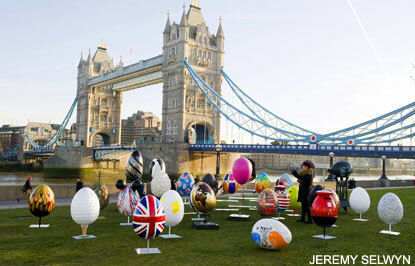 You can find out more about the Big Egg Hunt right here on http://www.facebook.com/thebigegghunt or http://www.twitter.com/thebigegghuntTwitter. Good luck P-p-p-picking out the penguin!